Tier 4 Final-compliant MaxTorque™ clean diesel mowers offer double the fuel economy and can save up to 900 gallons of fuel over 1,000 hours of operation, compared to gasoline- and propane-powered mowers. The superior fuel efficiency of MaxTorque™ diesel also reduces emissions of greenhouse gases, according to test data from the U.S. Environmental Protection Agency and California Air Resources Board. 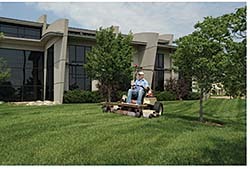 Combined with a full-line of time- and labor-saving implements, the mowers can be put to use year-round for added productivity and value.